Pakistan’s former spy chief, General Asad Durrani, is facing flak. His former colleagues in the army are fuming for his latest endeavour – writing a book in collaboration with Amar Singh Dulat, former head of the Research and Analysis Wing (RAW), the premier Indian intelligence agency. General Asif Ghafoor, head of the ISPR, Pakistan military’s public information arm, summoning Durrani to the General Headquarters indicated that the retired General might have violated the Military Code of Conduct that is applicable to all serving and retired military personnel. Many retired army men are not that circumspect or willing to extend any courtesy to the retired General and they are openly blaming him for impropriety. An newspaper columnist and old friend Farooq Hameed Khan, a retired brigadier who also had a stint at the ISI, compared Durrani’s action to a hostile act and put him in league with other known Pakistan-baiters like Hussain Haqqani, the pro-US former Pakistan ambassador who is now employed by the US think-tank circuit. Khan describes Durrani’s book as part of the hybrid war and counsels his military to “rise to defeat the enemy inside”. In the past, many Pakistani Generals have written books, including a tell-all chronicle of confessions by Lt. Gen. Shahid Aziz about how Gen. Musharraf planned and executed the ouster of duly elected Prime Minister Nawaz Sharif in the 1999 coup. However, the latest book seems to have rattled the military establishment, not for the value of the mundane and already known ‘facts’ that Durrani tries to sell under a new label, but because the former Prime Minister Nawaz Sharif’s use of the material to malign the army. Sharif, who is battling multiple corruption charges that saw his family accrue billions of dollars of wealth in the last three decades, is desperate to die as a martyr in the cause of democracy rather than go down as a corrupt politician and a thief. Therefore, ‘the Durrani leaks’ come in handy for a belligerent Sharif who is desperate to rescue his reputation. 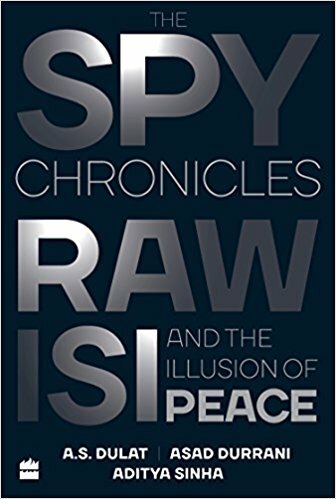 The Spy Chronicles: RAW, ISI and the illusion of peace is a running commentary of the conversations between the two former spy chiefs. Moderated by the Indian journalist Aditya Sinha, it is peppered with speculation or analytical conjecture on the past events or wild guesses about some future scenarios – from possible Indian reaction to any future terrorist attacks from Pakistan or the future trajectory of Kashmir and the India-Pakistan engagement in view of any specific hypothetical stimulus. Durrani comes across as candid and frank, even nonchalant at times but wedded to a narrative that has currency within the American policy circles. In comparison, Dulat is cautious, mostly diplomatic and quite circumspect in his responses. He remains guarded and even deliberately obfuscating when it comes to his own role or that of his organisation in scheming subterfuge and planning insurgencies in the region. During the conversations spanned across several countries and seasons, Durrani addresses Dulat as Amarjit but as the time progresses he tends to adopt a formal tone, a feeling that does not reflect in his free-flowing conversations. In comparison, Dulat sounds quite patronizing and appeasing as he prefers to address Durrani as General Sahib or even boss, perhaps with a view to inflate Durrani’s ego and conjure up a faux milieu of his past wherein he remained very important and exercised a great deal of control over Pakistan in an all-encompassing sense. The conversations that form the book often start over a tipple, and not surprisingly Dulat seems to be is in control of the banter as he guides and directs Durrani towards a path that more or less reinforces New Delhi’s positions or narratives. For example Durrani appears to support Indian notions that the non-state actors in Pakistan are capable of launching the Mumbai like attacks and that it must warrant India to extract revenge by attacking targets inside Pakistan. Durrani sleepwalks into the setup as he starts to sympathize and endorse the Indian official view that the Mumbai terror attacks of November 2008 had backing from the elements within the ISI, a position that was recently articulated by Nawaz Sharif. Durrani uses a false claim from a CIA mole, David Headley, within the terrorist group Lashkar-e-Taiba about “an ISI major” to try to support Indian claims on the atrocity. The Mumbai Attacks remain couched in controversy amid gaping holes in the declarations that put the blame on the Pakistani state structures. Durrani also discredits Kashmiri political movement, Hurriyat Conference, and suggests that it was forged and later managed by the ISI. Although Durrani had left at the time the Hurriyat was formed, his claims have thoroughly embarrassed the Kashmiri leadership and compromised their prestige, including perhaps their future political weight and character. The positive aspect of the book is that it makes bold statements about India and Pakistan and the situation in Kashmir. Both agree that no country is in a position to change the status quo on the ground and therefore call for rapprochement. However, they lose steam as their prescriptions or suggestions sound too cosmetic or simply unimpressive. Both of them seem unwilling to acknowledge the changing atmosphere in India – the rise of mass hatred and paranoia against Muslims, its official patronage and even justification, growing militarization of nationalism and its ever-changing new narratives as well as phenomenal increase in hatred against Muslims and Pakistan, and ossification of this revulsion across the elite society – from the military to politicians and media to diplomats. This informs the public opinion and their behaviour; causing an unprecedented surge in public violence, including murder, against the Muslims in particular. In his self-propelled enthusiasm, Durrani even proposes a confederation between the two countries – a fanciful prospect that Dulat is even reluctant to admire. I found interesting similarities between Durrani’s vision of Akhand Bharat and a US-funded official study about the future of South Asia. The study, Asia 2025, conducted by the US Undersecretary of Defence (Policy) in 1999, envisaged India taking over Pakistan after the US neutralizes Pakistani nuclear weapons to avoid a nuclear war following deadly ‘terrorist incursion’ from Azad Jammu and Kashmir (AJK) into the Indian side of the territory. As Pakistan loses control of the situation, it fails to respond to the Indian calls to reign in the militants, and as a result, India moves into AJK. According to the study, India also launches an unsuccessful conventional strike on Pakistani nuclear arsenal, prompting Pakistan to launch nuclear strikes against Indian forces along their common border. The US threatens China to keep away from the theatre of war and attacks and destroys the remainder of the Pakistani nuclear forces leading to total anarchy. In the American imagination, Pakistan disappears by 2020, and the Indian confederation emerges as a regional super state. In the meantime, Afghanistan is also dismembered and annexed by the neighbour states – Iran, Tajikistan and Uzbekistan – per their ethnic proximity. In the end, India and Iran emerge as great powers and become allies of the US willing “to participate in combined peace operations with the US” and also as a countervailing force against China. Dulat comes across as a crude salesman who wants to sell his single-dimensional formula of meetings as a solution to the multi-faceted and multi-layered problems that beset the two countries. He remains ossified within his own rigid hierarchies of wisdom and shows a strange fixation at getting Ajit Doval, the Indian Security Advisor, an official invitation to visit Pakistan. Vouchsafing for his friend, Dulat says to Durrani: “Doval would enjoy this. That’s why I keep saying get him to Lahore. He loves Pakistan!” Such an invitation would summon mass rancour given how Doval has openly advocated for destroying Pakistan and claimed credit to a large number of unsavoury activities inside Pakistan in his previous avatar as disguised Indian spy. Dulat puts too much emphasis on trade (in his jargon business) between the two countries as a strong motivation for peace, but conveniently forgets to mention the China-Pakistan Economic Corridor (CPEC) as a much bigger opportunity that can link the regions, including Kashmir on both sides. He also wants Hafiz Saeed persecuted but Kulbhushan Jhadav released and creates false alibis for several Indian hawks – from Prime Minister Modi to G. Parthasarathy, a former diplomat.